One day while walking around Michaels, I came across these super cute photo frames that had rope going around the outsides to hang them with. I instantly knew the perfect spot for them in my home! So I bought them, took them home, and then instantly hung them on the wall. The only problem was I didn't know what I was going to replace the "fake family" photo with. Since the frames are hanging in the dining room I didn't necessarily want family photos on the wall. (I love my family dearly, my whole living room wall is full of them to prove it!) They probably hung there for 4 months before I had the perfect idea for them! 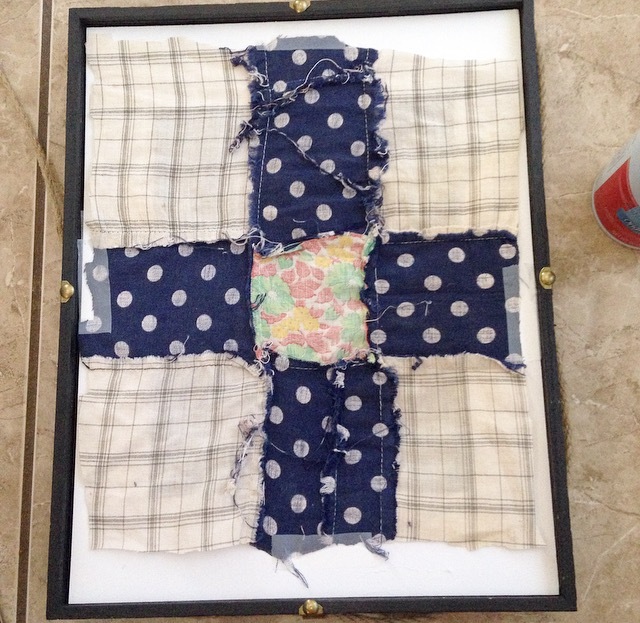 I came across some very old quilts at a garage sale once that no longer had the backing on them and they were pretty tattered. I bought them anyway knowing one day I may have a use for them. 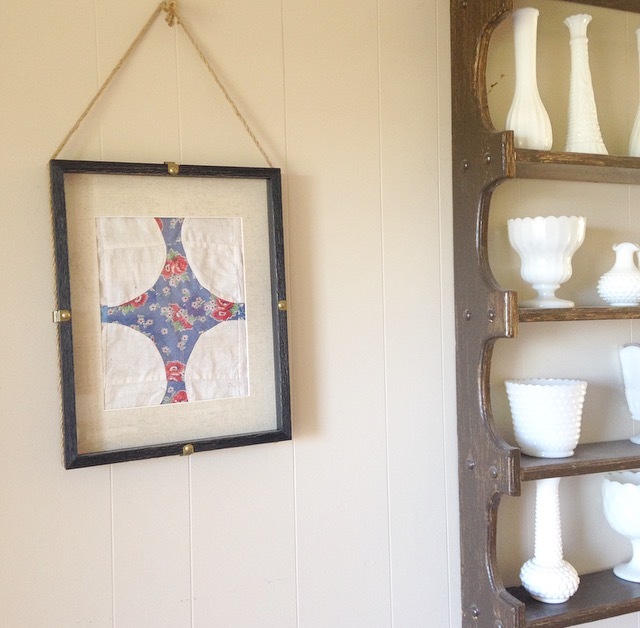 I cut out a square of the quilt to fit the inside of the frame and had instant wall art! My heart is with old quilts so this idea was genius to me! If you know me you know that I LOVE decorating with items that are dear to me! 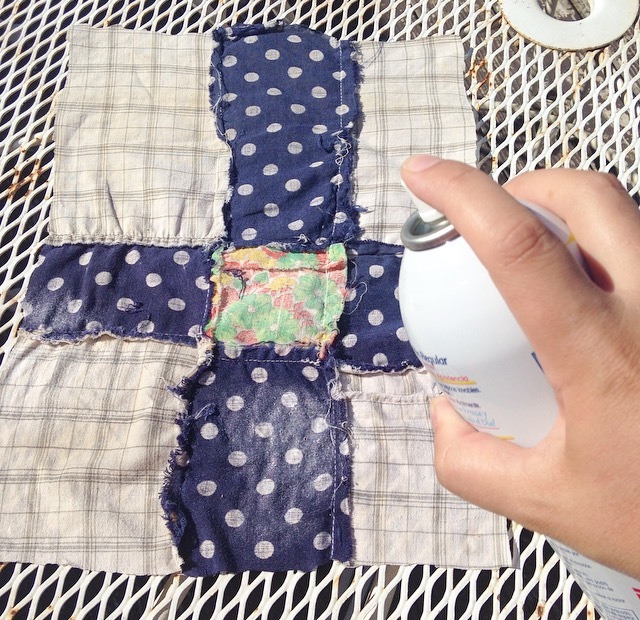 I will take you through an easy step-by-step process below for some old quilts you may have lying around but not necessarily know how to use them. 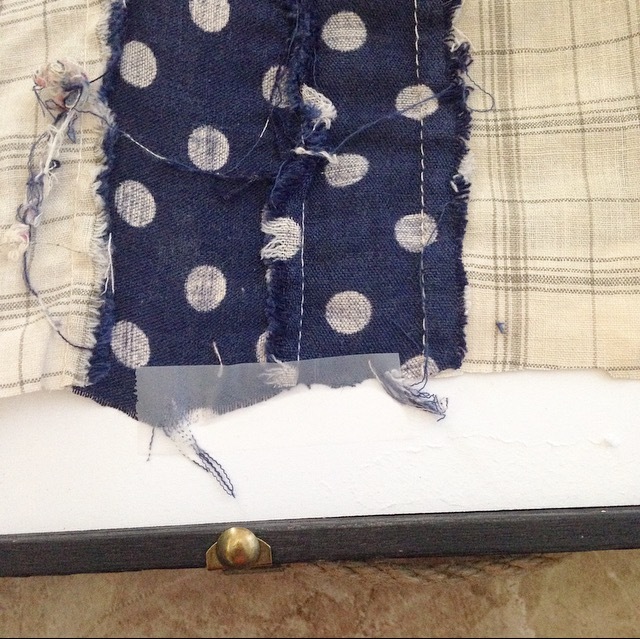 Here is one of the old quilts that is torn up. As you can see the backing is no longer on it so I didn't feel bad cutting it up. 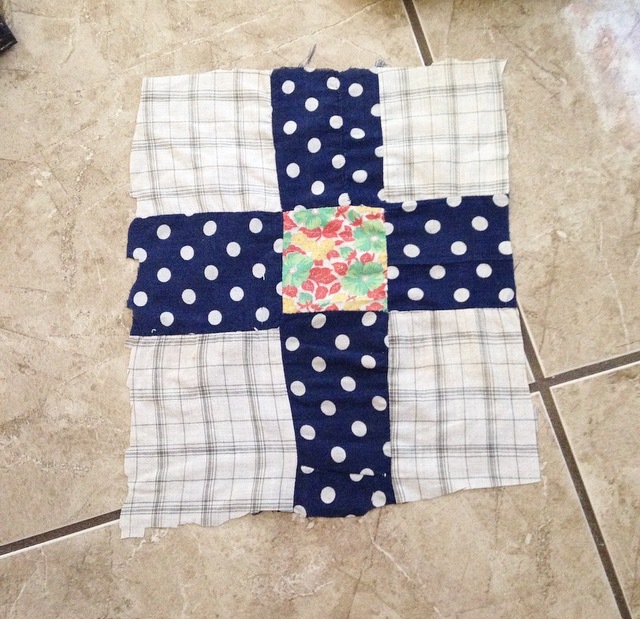 First, take the quilt and cut a square using the frame template as a guide for size. For the next step, I recommend doing it outside. If you are inside, I would put a sack underneath just to keep the starch from getting on anything unwanted. After you cut your square, lay it out on your surface and thoroughly spray it with the spray starch smoothing it as you go. Let the fabric completely dry before moving on to the next step. Once the square is dry, you can begin to frame it. Just lay the square in the frame and use the Scotch Tape to pull the sides tight and to keep it in place. 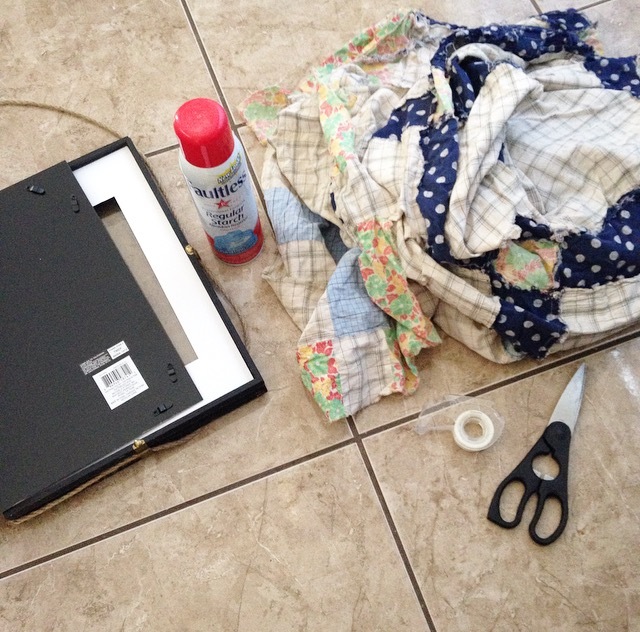 I used a frame that had a mat included making it easy to tape the quilt tightly. After you have it in place, secure the frame cover back on and you are ready to hang for instant, one of a kind artwork! I used two different quilts that I had on hand so that I would have two different quilt patterns in the frames. Here are some pictures below of how they look in my dining room. 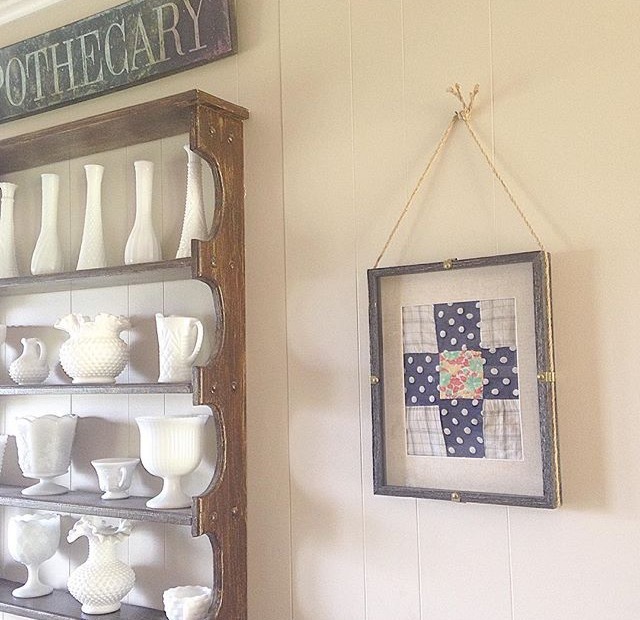 If you make your own "quilt art" tag me on Instagram @vintagehomeok or send me an email with a photo attached! I would LOVE to see yours! What a fun & easy DIY Daraka.....love it and your easy instructions too! What a cute idea. 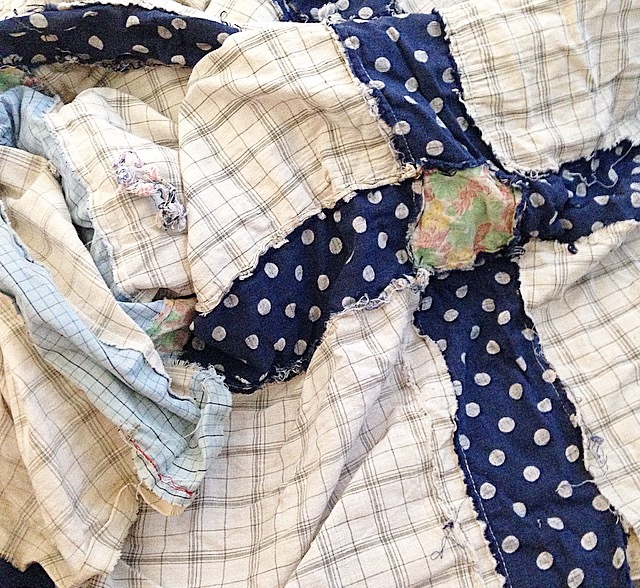 I have some old quilts in the attic that might need to be remade into something else. Thank you Carol! If you use them I would love to see!